L96A1 - Call of Duty: Black Ops Guide! 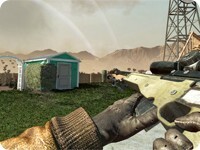 The L96A1 is unlocked for purchase at Level 27. The L96A1 is extremely powerful, due to its high damage multipliers, which ensures a one-hit kill to the shoulders, stomach, chest or head. This makes it a favorite weapon of trick shooters. However, the L96A1 has very high recoil, a slow center speed, and a low rate of fire. This leaves the player vulnerable and makes follow up shots difficult. It also has the highest amount of sway of all the sniper rifles. 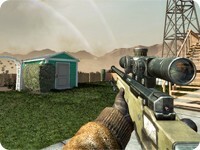 Set to 6 degrees, this follows the trend given to most bolt-action sniper rifles in the Call of Duty series, such as the R700 from Call of Duty 4: Modern Warfare and the Intervention from Call of Duty: Modern Warfare 2. The L96A1 utilizes the semi-unique SUSAT scope when equipped with the ACOG scope attachment, sharing this trait with the Enfield. Like other sniper rifles, when using a Suppressor, the L96A1 can only get one shot kills to the head and neck. However, since all snipers have the same damage multipliers to the head, the L96A1 is a poor choice to use while silenced, due to the high recoil and low fire rate. 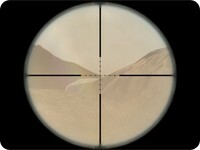 Due to its potential for one shot kills, it is one of the most commonly seen sniper rifles. The primary difference between the L96A1 and thePSG1 is that the L96A1 has a slower fire rate due to being bolt action, but in return has a 1.5 multiplier to the shoulders, allowing for more consistent one shot kills to the upper body. The PSG1 on the other hand has lower sway and can be fired semi-automatically. With these details in mind, choosing the L96A1 or the PSG1 comes down to personal preference.